Call us today for free range chicken! Quality always shows at Falvo’s Prime Butcher Shoppe. When you are looking for organic/hormone free meats, prime meats or store made sausage in the Albany, NY area, call or stop into Falvo Meat Market today! Falvo’s meat market is an old time butcher with prime meats, free range chicken, family freezer packs and whole roasting pigs at reasonable prices. Open from 9 am to 6 pm Tuesday through Friday and from 8 am until 5 pm on Saturdays, we’re located in the heart of Tech Valley, just outside Albany, NY, just 500 feet off of Route 85. Our address is: 386 Maple Rd (Route 85A), Slingerlands, NY. See our selection of organic/hormone free meats and free range chicken! Our old-fashioned, family run Italian butcher shop looks to provide a huge stock of USDA choice prime beef and grade A poultry products to our faithful customers. The careful and unique methods used to process all of our sausages, ground meats, delicious meatballs and Italian dinners, have been a part of family tradition and preparation since 1974. We have the Capital Region’s best Delmonico (prime rib eye), NY strip, and beef tenderloin (filet mignon) steaks. 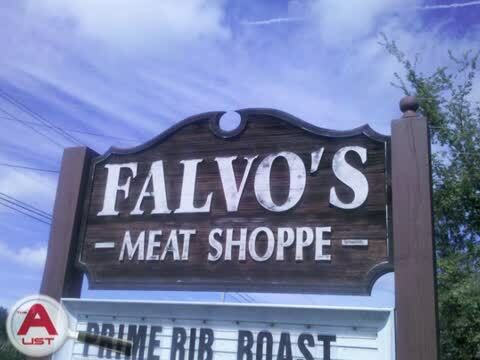 When getting ready for that summer barbecue or special dinner, a visit to Falvo's Prime Butcher Shoppe is what you need to get that special cut of meat. Also offering high-end pork, poultry and free range chicken. We sell fresh meat including free range chicken, family freezer packs, ground meat, organic/hormone free varieties, store made sausages, and more! We know that you want your family to be healthy and environmentally responsible, which is why we’ve dedicated ourselves to providing Albany NY with free range chicken and other sustainable and organic products. Our friendly staff members can answer any of your questions and make sure you go home with the right meat for your family. We offer many types of quality meats for your family’s budget including freezable family packs or whole pork loins and NY strips; Falvo's Prime Butcher Shoppe can sell the amazing meat products that you expect in larger orders. Falvo's Prime Butcher Shoppe even offers whole beef tenderloins cut into steaks or roasts and trimmed, ensuring that your family gets the same quality and taste when ordering in bulk. Try our store made sausage! Don't be afraid to be a S.L.O.B. [Support Locally Owned Businesses]!!! Locally owned businesses pay taxes to local government and programs, spend revenue and capital locally and support your friends, family, neighbors and schools. Support your local Albany, NY businesses today! The quality of meat offered by Falvo’s goes above and beyond what the supermarkets are prepared to sell. Our steaks and meat products are clearly superior because usually a customer cannot find USDA Prime or even USDA Choice in a supermarket's meat section. This is because the limited supply of such quality product is gobbled up by fine meat purveyors that sell the meat to high-end restaurants and affluent buyers. At the end of the day, you may be in danger of spending extra money on poorer quality meat at a supermarket! If you happen to be heading towards Thacher Park or if you just want to treat your friends and family at the next party or barbecue, stop by, pick up some quality meat for your special meal in Albany, NY. You can taste the difference between the products at a supermarket and Falvo's Prime Butcher Shoppe. Whether you’re preparing beef, pork, chicken, lamb, veal, seafood or specialty items like boneless duck breast, half cooked ducks, hangar steaks, flat iron steaks, lamb shanks and quail, Falvo's Prime Butcher Shoppe offers a higher end product and a fresher taste. Our ground meats are cut and ground in the store! For seafood offerings, Falvo's Prime Butcher Shoppe carries fried fish every Wednesday through Friday. Our family freezer packs are a great value. For $59.99, you get 28 lbs of meat to store in your freezer. All of our meat products offered are wrapped for the freezer at no extra charge. Some product substitutions are accepted at the discretion of the owner. Please phone or fax your Family Pak order at least 2 hours in advance. Sample our store made sausage and our antibiotic free and organic/hormone free meats. Try our Jaindl turkeys. They have 55 percent less fat and 25 percent fewer calories. We also carry Sahlen’s Deli Products, Miss Sydney’s Original Marinade, Indu’s Chutney and Dinosaur Bar-B-Que sauces. We have a wide variety of beef, pork, poultry, and seafood products. Whether you are looking for raw, smoked, or breaded products, you can always find what you want at Falvo Meat Market! We also carry Jaindl turkeys and can offer a cut designed for almost any method of cooking. Consider our selection of Jaindl turkeys which is one of the largest in the Albany, NY area. Whether you choose to have your deli meats hand-sliced or hand-cut, we have you covered. Order a whole roasting pig for your party. One week notice and a $50 non-refundable deposit are required at time of order. Give the gift of great meat with a Falvo's gift certificate! They’re perfect for all occasions! Stop by to pick one up today!